Haas Kowert Tice are featured with Gillian Welch & Dave Rawlings in a musical celebration called Dream Highway. The concert will feature Gillian Welch, Dave Rawlings Machine, Willie Watson and Haas Kowert Tice at Festival Hall in Melbourne on February 20. 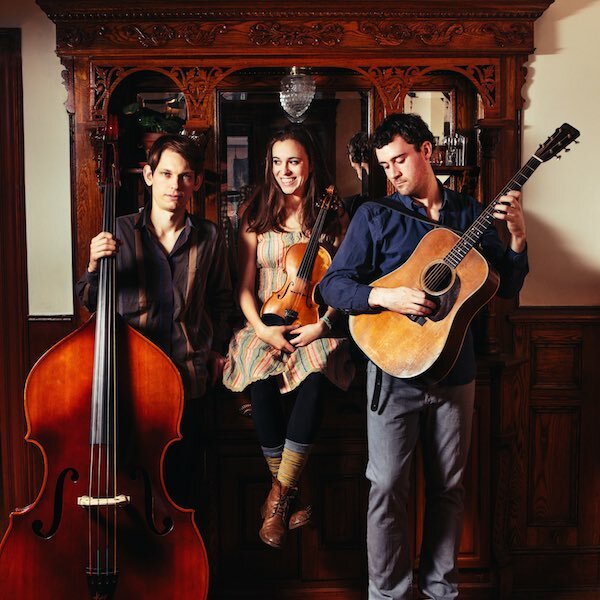 There’s a lightness and joy to the music of American roots trio Haas Kowert Tice, a sense of weightlessness that belies the complexity of the musical arrangements. This is music that uplifts, that soars, but that is also grounded by a respect and love for tradition. With just three acoustic instruments – fiddle, guitar, upright bass – Haas Kowert Tice are building a new kind of roots music. Made up of three of the most exciting instrumentalists on the scene today, this trio of fiddler Brittany Haas (Crooked Still), bassist Paul Kowert (Punch Brothers), and guitarist Jordan Tice (Tony Trischka) have come together on their debut album, you got this, to use their string band roots to engage in close dialogue. Entirely instrumental, this is wordless communication heard from three distinct voices working for unity. There is so much we don’t have to say to each other. We got together because we wanted a project in which we could explore our ideas; we wanted to see what we could find. We each contributed writing, and were each able to tinker with each other’s ideas. I think in this album you hear discovery – Paul Kowert. That joy of discovery is key to this collaboration of master instrumentalists. It’s also the fuel that’s powered their careers so far: Brittany Haas exploring fiddle traditions with Bruce Molsky, Darol Anger, and Alasdair Fraser; Paul Kowert’s ground-breaking work with The Punch Brothers and now Dave Rawlings Machine, and his studies with Edgar Meyer; Jordan Tice’s ensembles and recordings with like-minded artists like Noam Pikelny and Casey Driessen. The thread that ties this all together is a driving passion to share great music with friends. Trying to track the many overlapping influences on you got this is a labyrinthine process. For example, “Grandpa’s Cheesebarn,” a tune composed by Jordan Tice, brings together alternate banjo tunings, Norwegian dance tunes, hard-rocking folk rhythms, and Debussy-like string arrangements. We’re all living lives that are bursting at the seams with all sorts of music. I think we’ve been inspired by similar things over the years and have inspired and influenced each others’ musical paths – Brittany Haas. Haas Kowert Tice also love to experiment with delicate balances. Opening tune “Leadfoot” slips back and forth between a buoyant dance tune and the deep growling of Kowert’s bass lines. “Tell Me Whatcha Gonna Do Now” trades off a gorgeous, pastoral guitar line from Tice with Haas’ devilishly syncopated fiddling, incorporating sudden moments of softness and tranquility. There’s an element of surprise to the music of Haas Kowert Tice; tunes take unexpected turns, and melodies duck and weave in abrupt and exciting directions. Listen to the album on SoundCloud. Tickets are now selling for the concert here.